Project Joy and Hope was created to promote physical and psychological care for children with life-limiting illness. We exist to help families of these children through a variety of different services and projects. HOPE Housing – a "home away from home" for seriously ill children, those who have undergone a transplant and children requiring hospice care. Project Joy and Hope proudly presents our Tulip Project , a peaceful residential facility inside Beltway 8. 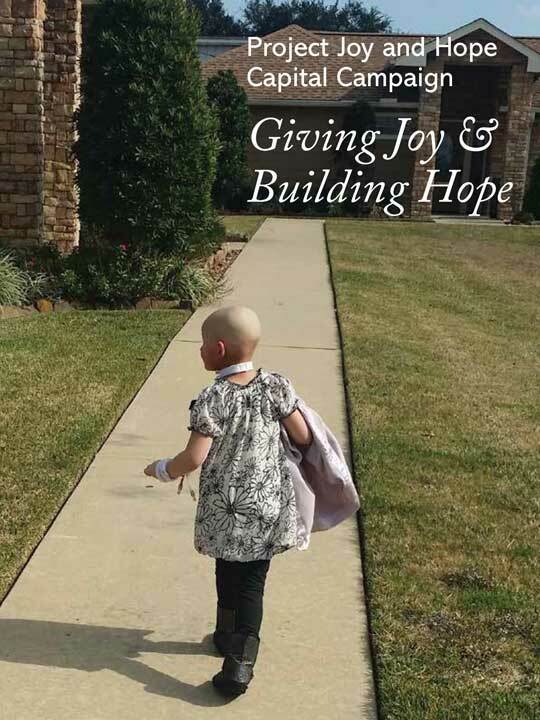 Family Assistance Grant Fund – helping families throughout Texas whose children require ongoing treatment for serious illnesses or pediatric palliative care. The fund covers “real life needs” such as out-of-pocket costs for hospital parking and meals, rental needs and utilities. Hope Scholarship Fund – provides scholarships for bereaved children who have experienced the death of a sibling or parent. Over $700,000 has been awarded to very grateful children since the program’s inception. H.O.P.E. (Helping Our Pain Ease) – is parental bereavement support classes in a seven-week series. Holiday Gift Program – is a way to provide holiday gifts and financial assistance for seriously ill children and their families. Your company may want to "adopt" a family this year. Classroom Bereavement Management – is a training program for teachers to help grieving students. 1-866-JOYHOPE – is a toll-free parent-to-parent support line. Texas Pediatric Palliative Care Consortium – an alliance of palliative care professionals from pediatric hospitals and hospices throughout Texas. To access any of our programs, call Project Joy and Hope at 713-944-6569 or our toll free line at 1-866-JOYHOPE or e-mail us at [email protected].